With their clear contours, these space dividers exude an air of timeless perfection. Less is more. As well as protecting privacy, they also serve to structure larger open spaces, to allow or deny access and to create and accentuate lines of vision. 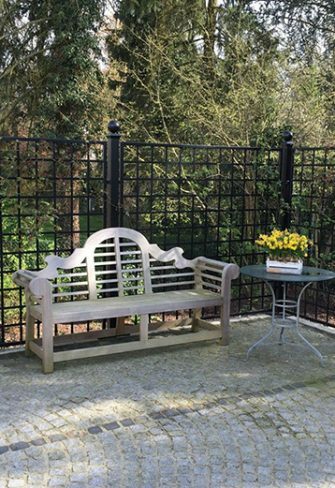 They can be used as superior fencing for private gardens, both modern and classical. 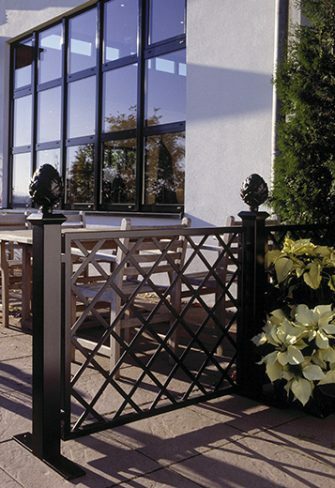 At hotels, golf courts or thermal baths, fences facilitate sophisticated spatial arrangements. Classic Garden Elements specialises in manufacturing top-quality privacy screening and space dividers with a distinctive classical appearance. The Bauhaus, Paravent and Restaurant Trellises are three excellent examples. When looking for ideal fencing and divider-trellises for today’s gardens, people are increasingly turning to steel structures. Wood, the more traditional material, is being used less. This is partly because it is strongly rustic in character and does not comfortably match the urbane, post-modern style of contemporary buildings. In addition, the wooden models available on the market tend to be somewhat rudimentary, even coarse in shape – mass-manufactured to “garden-centre standards”. An obviously bargain-price wooden fence at the entrance to an expensive, high-end property will strike any observer as incongruous, It is unlikely to appeal to potential purchasers. It is important that the stark, clean lines of contemporary architecture are reflected in the fencing and space dividers we choose. This can be achieved by restricting ornamentation to strict and recurring geometrical forms, which is why the latticework of Classic Garden Elements trellises is composed of simple diamond or square patterns. The classic pine-cone or ball finials used to top the trellises’ 8-centimetre thick posts create their own special effect, although they can also be omitted completely if the intention is to achieve a more austere effect. 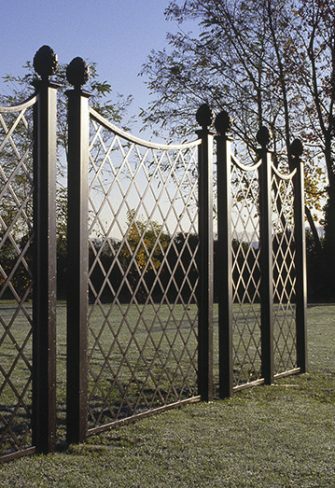 It is essential for fencing and trellis-dividers to be anchored firmly in the ground. For this purpose, Classic Garden Elements offers two different methods, both well tried and tested. Either the trellis’s vertical supports are lengthened by 50 centimetres and set in concrete. Or alternatively, they are welded to special base plates, which can in turn be mounted on frost-proof concrete foundations. We will be happy to advise you as to which of these solutions will work better on your property. Trellises covered in richly flowering plants create an effective screen of privacy around a patio, terrace or garden. The denser the foliage, the better we can spend balmy evenings caressed by green leaves and protected from prying glances. At the height of summer, the trellis and the show of blossoms fuse to become a lush tapestry of greenery as climbing roses envelop us with their colour and fragrance. Inside the garden, where privacy is less of a priority, trellises are a charming way of dividing up space. In larger gardens, they can be used to create different sections. Unlike shaped hedging, which often takes years to grow to the size desired, metal trellises and fencing have an immediate visual impact. As a rule, they are also considerably less expensive than specially erected walls. When covered with roses, they are an attractive and easy way of creating two or more distinct sections in your garden. And if you’d prefer something other than roses, there is a wide range of climbing plants you can choose from, whether for their colour, their scent or their attractively shaped leaves.